SPECIAL OFFER : WEEKEND at ILAIRA, Chrani Messinia. Stay 3 nights HALF PRICE 90€ (2 adults) from 4 till 7 of JULY. Book Now! Your home is waiting for you. 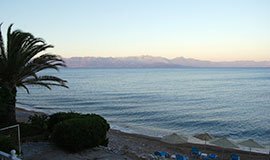 Come and you will feel the comfort of Ilaira, the smell of the sea and the spirit of Greece. 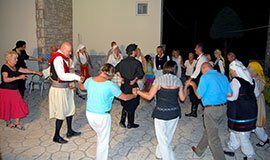 On a regular basis we organize Greek Traditional Nights where everybody is invited to lively participate. Enjoy your vacation at the unforgettable beaches of Chrani and rejoise life at it's best. Beautiful beach, crystal clear water, sun beds, umbrellas and all this paradise just 10 meters from our hotel. Ilaira Apartments opens the summer season of April 1. Temperatures will be high, as well as our service. Visit our gallery and book your vacation right now. Spend an exciting summer in Greece - the country of the gods and the best wine.